1. 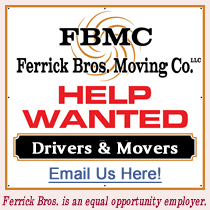 Call Ferrick Bros. Moving Co. (FBMC) at: (978) 225-0158 as soon as your home is put up for sale. By calling early, you can explore all kinds of moving options. After the Purchase & Sale Agreement is signed, your options disappear. 2. Start packing all non-essential items. Pack a box a day and you will not be overwhelmed when moving day comes. 3. Clean out Attic, Basement, Sheds & Garage. Get rid of anything you don't need. Roll-off dumpsters can be delivered to your home in all sizes -- 10-15-20-30 yard sizes -- we recommend Pistone Trash. 4. Stop shopping in bulk. If you are paying a mover to move Sale Items, the cost of that Sale Item just cost you money. 5. When packing the main house, remember -- you do not need to empty bedroom furniture. Clothing may stay in the drawers. Any breakable Items or Jewelry should be packed. 6. Place all T.V. and Stereo Remotes in a box and mark it as such. Remote Controls are the one item people always call to see if it was left on our truck. 7. Anything that can fit in a box should be packed in a box. This includes lamps and shades, pictures and artwork, stereos and radios, etc. 8. Any appliance being moved should be disconnected before movers arrive at your home. It is the customer's responsibility to have all appliances prepped according to manufacturer's guidelines. Customers can go YouTube (www.YouTube.com) and enter brand of appliance; then shipping bolts. (Example: Samsung Front End Washer Shipping Bolts) NOTE: There should be a YouTube video for most brands. 9. The following should be drained for the move -- lawn tractors, lawn mowers, snowblowers, and anything with fuel should be emptied to avoid a spill in the truck. 10. My rule of thumb when telling people how to pack, is: Do not pack anything that could spill and cause damage to a couch. When we load our truck, we will load the truck from floor to ceiling -- and boxes go on top. NO LIQUIDS in boxes, please!! 11. Picking your mover early gives you one more person you can call for help. 12. If you need to de-clutter your home, FBMC has storage. Many times people decide to do their move in 2 stages. First Stage de-clutters your home. This makes the Second Stage much smoother because all the clutter is gone. 13. Many people believe they can't afford a mover. Getting a free estimate is the best way to find out if you can afford a moving service. 14. For our Moving Clients / Customers: If you need to get rid of furniture items that are too good to throw out, FBMC has many avenues for you to take that we can explain to you. Please contact Bob Ferrick directly at (978) 225-0158 for more information. 15. Calling FBMC for an estimate, I can give you a moving plan built for you with YOUR timeline in mind -- not just a standard plan. Everyone has different needs.